Northern Ireland's unique tandem only sportive is taking place on Saturday 8 June supported by Maryland Wheelers. This year the Maze Long Kesh site (94b Halftown Road,Lisburn, BT27 5RF) will be the base as it has perfect facilities, an enclosed 2 mile circuit and access to a safe 10 mile route for those who want to go out on the open road. Following an historic medal haul at the Paralympic Games in London 2012, Cycling Ireland is looking ahead towards Rio 2016 where we aim to sustain the level of performance from our highly successful team. We are currently looking for male and female pilots to trial for a place on the squad. Successful candidates will have the opportunity to compete in at the highest level, have access to a Performance Coach and attend coach led training sessions. Our goal is to have a number of World Class pilots well trained and pushing for places on the Elite squads for the Rio Paralympic cycle. 2012 Paralympic gold medalist, Mark Colbourne is set to inspire the local business community when he speaks at an exclusive event in Belfast later this week. Wednesday 5th September sees the full Irish Team in action in Brands Hatch, where they compete in the Time Trial events on the Road. Going into this event Ireland boasts two top seeds in Mark Rohan and Colin Lynch, who are both World Champions in this discipline. Paralympic Silver Medalists in the Pursuit, Catherine Walsh and Fran Meehan, won a Bronze medal in this event last September in Denmark, and will looking to build their medal tally. Men's Tandem Narrowly Miss out on Bronze in the 4km Pursuit - In what was the race of the day at the Velodrome in the Olympic and Paralympic Park, the tandem pairing of James Brown and his pilot Damien Shaw narrowly missed out on the Bronze medal in a race that saw the lead change several times throughout the 4km competition. After months of preparation, 34 of the world's elite women time trial cyclists from 12 countries took part in the Celtic Chrono at Stormont Estate today with local Olympian, Wendy Houvenaghel triumphant. 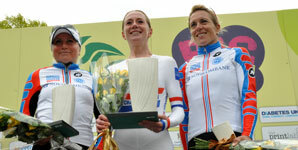 The elite women cyclists rode the 22 mile track taking in Newtownards and Bangor with Wendy Houvenaghel, riding for Team GB in the Olympics in London, recording the fastest time on the trial of 48mins 35.09 seconds.